Operable walls are ideal for offices and meeting rooms. 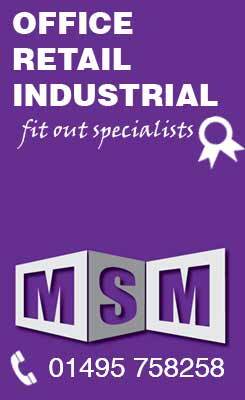 They can combine flexibility with a high quality finish as well as excellent sound reduction properties. 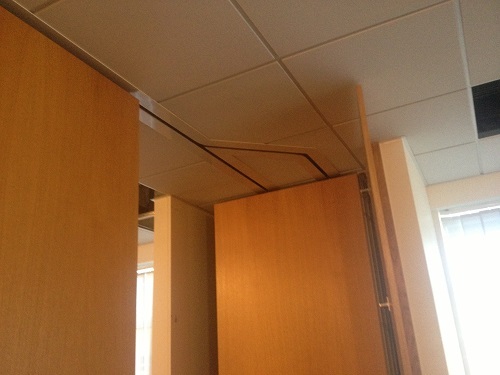 Our expert services allowed RPS to make the most efficient use of their space. With large open areas they needed our services to separate this space providing them with a large conference room when needed but with a space that could be used as smaller offices on a day to day basis. We installed an operable wall which is ideal to temporarily divide the large area creating private spaces with a solid and safe wall. The operable wall is designed to store away in a parking bay when it is not in use for minimal visibility and its excellent sound properties provide RPS the perfect balance between open space and private meeting areas. 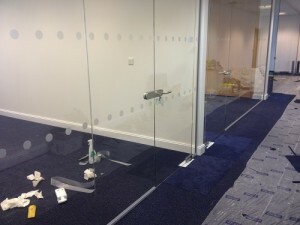 Vitrage glass partitioning was used to provide seamless glazed frontage to RPS offices and meeting rooms. The partitioning system was designed to use the minimum of framework giving a seamless appearance. To maintain the open feel glass doors were fitted. Sound reduction of up to 47 DB can be achieved using this system providing areas suitable for confidential meetings and concentrated work but still maintaining the light and spacious feel to the office. 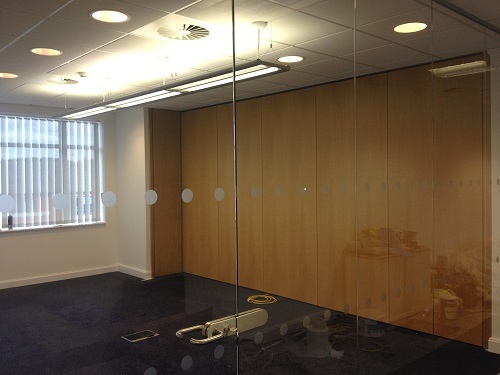 Glass manifestation was used in the form of safety dots to highlight the presence of the glass as well as providing a stylish and professional feel to the partitioning system. Glass manifestation is available in an unlimited amount of designs and colours and can be used to reflect the business culture or to reinforce corporate identity such as the company logo or motto as well as acting as an important safety feature. The finished result provides a modern office environment for both and staff and customers to enjoy. Office interior refurbishment and fit outs.